We recently found out a very important reason for getting your dog tested for heartworm any time you change preventives. Don’t get caught out – read on! 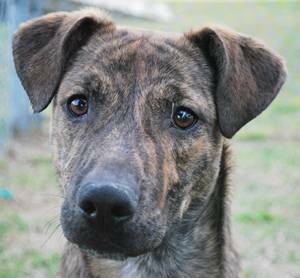 There are a few reasons why you might decide to change the brand or type of preventative heartworm treatment that you are giving your dog. For example, it might turn out that your dog is, or has become, allergic to the chewable brand you have been using, you might decide that you want to change to a spot-on method rather than an oral tablet or chewable, or you might just decide that you want to change to a less expensive, generic version. Whatever the reason, it is important to ensure that your vet does a test at the time you are wanting to change – and here is why! We recently published a reader’s heartworm story from Doug (read about his dog, Ginger’s experiences here). It came to light that despite never having missed a dose of preventive medicine, Ginger still tested positive for heart worm and needed treatment with Immiticide to kill the adult worms. Because Doug had never missed any of the medication doses, he contacted the manufacturer because under the guarantee, he expected that the cost of the treatment would be paid for. However, although the manufacturer was very helpful, they would not pay for the full cost of the treatment, only for the cost of the drugs needed. This was because, as they pointed out, (quite fairly, I think), that as Doug’s dog was not tested for heartworm before changing to their brand from another manufacturer’s brand, it was possible that Ginger was heartworm positive before even starting on the new meds. This only goes to highlight how vital it is to get this checked and for the few dollars a heart worm test costs is could save you hundreds of dollars in the long run. Of course, it is very rare indeed for preventatives to fail to protect an animal when given consistently, as directed and on time but if you check out Doug’s experience, I think you will agree that it is better to be safe than sorry. 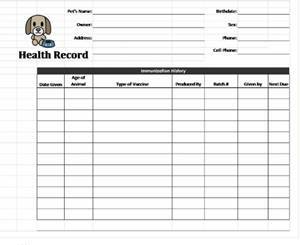 Keep all the health records of your dog, this is a free to download spreadsheet from the microsoft web site. Another important point came out of Doug’s story too – and that is how important it is to be sure you keep records of all your purchases of heartworm medications. He moved around quite a bit and it took him a lot of time and effort to track down receipts for veterinary tests and prescriptions in support of his case for compensation. If you use a windows based computer, and internet explorer as your browser, you can download a dog health record excel spreadsheet from the microsoft site at http://office.microsoft.com/en-us/templates/results.aspx?qu=pet+health&ex=1#ai:TC006128278|. The log spreadsheet pictured (left) is no longer available, the link takes you to the updated version. You could either print it out and keep it on file with all your invoices and vet visit records or keep it on your computer – neat! be sure that you follow your vet’s advice and give the new medication on the date he advises – this will usually be the date you should normally have given your previous brand if you had not decided to make the change. Please leave a comment below if you have encountered a similar problem, or ended up with an unexpected bill as a result of thinking you were fully covered and then finding out you were not.